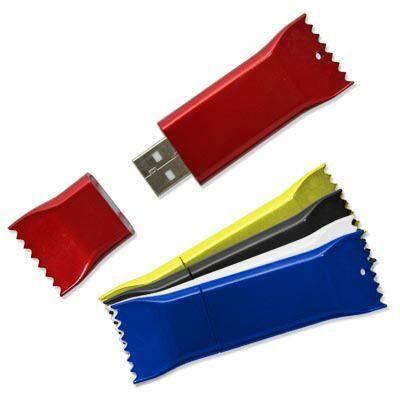 Give in to your sweet tooth with the Candy Wrapper promotional USB drive! This tasty treat features a removable cap that lets you gain access to the connector port while still providing protection. Customers in the candy or food service industries will eat this branded USB drive up. Up to 4 color silk screen printing makes for a beautiful advertising piece that is sure to be memorable. Sweeten promotional deals with this excellent giveaway item, the Candy Wrapper. It operates as functional data storage as well as advertising space. Your brand name or logo will be beautifully silkscreen printed right on the wrapper. The removable cap protects the data port and contributes to the overall design and shape. It comes in fun colors that will highlight your logo. Pre-load yours with data to continue your company’s message in the comfort and privacy of your potential customers’ own home.